Microsoft to challenge Apple with Zune phone? 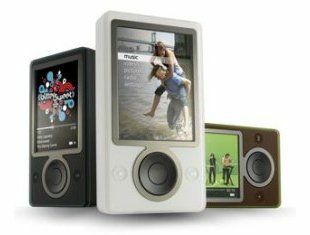 Given the magnitude of the first Zune's failure, it might be a good idea for Microsoft to drop the idea of building a Zune phone. What do you think? Microsoft has hinted that it hasn't ruled out the possibility of an Apple-challenging Zune Phone at some point in the future. A Zune phone might potentially combine the telephony features of Windows Mobile into a Zune-style design with enhanced music playing capabilities. "It wouldn't be unreasonable to think that at some point there might some integrated thing," said Mindy Mount, chief financial officer of Microsoft's entertainment and devices division, according to Reuters. Mount was asked the question regarding the potential of a Zune phone at Citigroup's global technology conference, one day before the big transatlantic Apple launch. It's rumoured that Apple is either going to announce 6G touchscreen iPods today. And it's possible that Apple might also be plotting the European iPhone launch. However, in spite of Mount's comments, in the past Microsoft has dismissed the possibility of launching a Zune phone. "It's not a concept you'll ever get from us. We're in the Windows Mobile business. We can put Zune into Windows Mobile, we can put Xbox into Windows Mobile. We can pour everything in," Microsoft CEO Steve Ballmer told journalists in April. However, Ballmer also said this in May: "There's no chance that the iPhone is going to get any significant market share. No chance. It's a $500 subsidised item. They may make a lot of money. But if you actually take a look at the 1.3 billion phones that get sold, I'd prefer to have our software in 60 per cent or 70 per cent or 80 per cent of them, than I would to have 2 per cent or 3 per cent, which is what Apple might get." So he's not got a great track record when it comes to making predictions in the phone market. Of course it's possible that Ballmer was not being completely honest. Microsoft has after all filed many patents in the last year that combine to strongly suggest a Zune phone is being designed. It could be that while Microsoft develops the Windows Mobile platform with Zune and Xbox connectivity, handset manufacturers might simultaneously build new phones designed especially for this purpose. The Zune phone concept is not dead in the water yet.